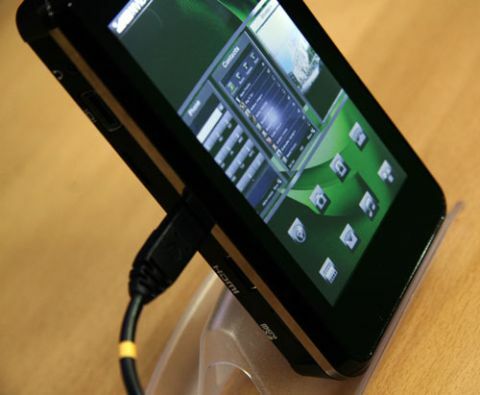 You might already know that Nvidia showcased its latest chipset during the Mobile World Congress 2008 at Barcelona and it seemed to be running smoothly on a neat and good-looking device. It even faced the challenge of being connected to a 60 inch plasma screen display graphics that would even make a PlayStation console jealous. The fact is that Nvidia’s new device powered by the APX 2500 chip managed to run a high definition H.264 720p version of Monsters Inc. on the above-mentioned plasma screen. Place this baby at the heart of an iPhone and we’ve got pure gold and a device that’s good enough to bury any PSP Phone out there. 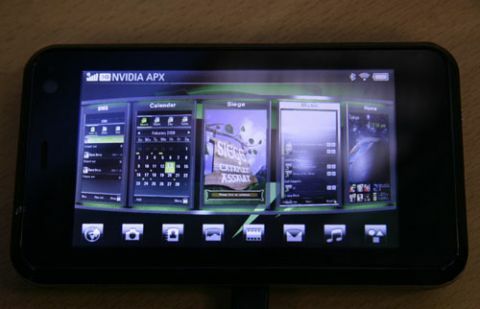 In case you’re interested, here are the specs of Nvidia handset: Windows Mobile OS and a 65nm chip composed of 4 parts. Among those, there’s an ARM 11 running the show at 750MHZ, then comes an audio/video core coding and encoding H.264 files and an imaging core with support for cameras with a 12 megapixel resolution. Last but not least of the APX 2500 cores is an OpenGL ES 2.0/Direct3D Mobile 3D graphics core, which gets the whole “PlayStation 2 resolution” thing going. The interface suited these specs perfectly, taking the iPhone UI to the next level, thanks to Mac OS X-style widgets and a carousel interface.